Japanese Episode AG 133: "Enishida and the Battle Frontier"
American Episode 403: "The Scheme Team"
Now that the Houen League is over, our heroes bid Masamune and Tetsuya goodbye as they head for their homes. After Haruka and Masato separate from Satoshi and Takeshi, they head back to Touka City to visit their parents. Meanwhile, Musashi-tachi have already arrived at the Rocket-Dan base in Kanto and report that the Magma-Dan and the Aqua-Dan have been disbanded. 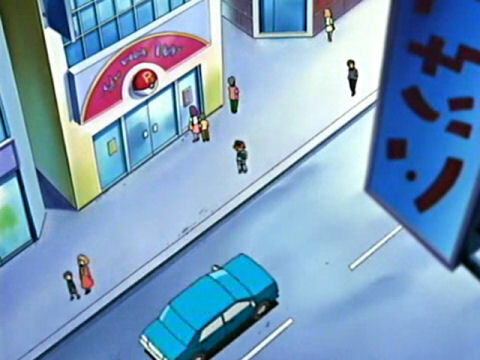 As they're given their new assignments, Satoshi and Takeshi arrive in Kanto. After Takeshi separates from his friend to return to Nibi City, Satoshi makes his way through Tokiwa City. There, he meets an elderly woman named Kikuko who reveals that she's the new Gym Leader for the Tokiwa City Gym! Satoshi says he already has the gym's badge, but Kikuko's desire to battle someone who placed in the Best Eight at the Saiyuu Convention convinces Satoshi to battle. 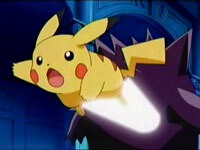 Though Satoshi's Pikachu puts up a good fight against Kikuko's Gängar, it falls prey to a combination of Hypnosis and Dream Eater, giving Kikuko the victory. Enishida, a man who Satoshi had met earlier and who was acting as the match's referee reveals that Kikuko is a member of the Four Emperors! He then tells Satoshi about the Battle Frontier, a new challenge that will have him fight seven trainers called "Frontier Brains" to earn items called Frontier Symbols. Satoshi decides to participate and eagerly heads home so he can set out on a new journey again. When the young trainer finally arrives in Masara Town, he is greeted by his mom, Orchid-Hakase, and Kasumi! As Satoshi reunites with everyone, Odamaki-Hakase and Masato arrive at his front door! As Satoshi catches up with all his old friends, he wonders what awaits him in the Battle Frontier. I always like the setup episodes to the next big region because they give you a sense of excitement. While it is really crappy that they put the Battle Frontier in Kanto, of all places, it's exciting to think about all the old friends we'll meet along the way. Of course, as the saga progresses, you realize the anime producers couldn't give two shits about bringing back older characters, but at this point it's nice to dream of what could be. The dubbed version continues to confuse us by leaving in the onigiri when we all expected it to be painted away. Come on, 4Kids, do you hate it or not? The episode had other paint edits, but other than those odd edits the episode turned out alright. I didn't really like Scott's voice at first, but it started to grow on me as the episode progressed. Agatha's voice was great because it wasn't that stock "old woman" voice the dub loves to use for every female over the age of 40, and everyone else performed to their usual standard. Two more seconds are removed from the episode's title screen. Finally, a second is removed from the shot of Takeshi's stew after the episode's title screen. When Haruka and Masato arrive in Touka City, the first opening to Advanced Generation, Advance Adventure, is heard playing in the background. This is replaced by instrumental music in the dub. May: "Dad's car isn't here." Caroline: "No, but he'll be back soon. Um, May? Your dad doesn't own a car. Seriously. Originally, Haruka just asked where her father was. The big sign in the foreground has its "text" removed. What's the point of erasing non-Japanese text? Have the Pokémon Chronicles editors taken over or what? The Rocket-Dan get a new motto after 400+ episodes! Jessie: "Prepare for trouble from the skies"
James: "From beyond the stars a nasty surprise." Jessie: "An evil as old as the galaxy..."
James: "Sent here to fulfill our destiny." Jessie: "To denounce the evils of truth and love." James: "To extend our reach to the stars above." Meowth: "And Meowth are da' names!" Jessie: "Anywhere there's peace in the universe." All: "To make everything worse!" MJC Carto Guy over at the Serebii.net forums gets credit for typing that up so quickly. I can't figure out what they're saying in the Japanese version even though it's the same motto in every episode. 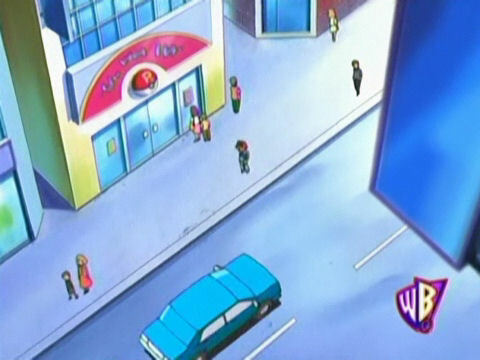 Two seconds are removed from the shot right after Kids' WB! 's final commercial break. Another vocal song in the Japanese version means another vocal song that's replaced by instrumental music in the dub! From the point when Enishida drives off until he puts on his slippers inside his house, Mezase Pokemon Masutaa is played in the background. In the dub, this is replaced by various instrumental music as the narrator is given all this extra dialogue about the Battle Frontier and how excited Ash is to compete in it. 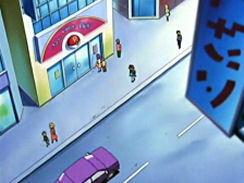 A second is removed from the shot of Satoshi running up to his front door. The final two seconds of the episode are removed.